Number 60 Box for sugared almonds, in polystyrene, choose the size. The number 60 box for sugared almonds is a type of concave 3D inscription perfect to fill it with coloured sugared almonds to set up the environment in which to celebrate the sixtieth birthday. The number 60 box for sugared almonds is available in different sizes. Choose the one that's right for you! Buying 3 pieces of number 60 sugared almonds box an immediate discount of 15%. In addition, for orders of € 90.00 i.v. you'll get a discount of 10% of the total purchase. The number 60 box for sugared almonds is a mould in polystyrene with a concave inside that is used to hold all the sugared almonds of all colours to set up your party. The number 60 box for sugared almonds is a concave 3D decoration depicting the number 60. These numbers are made of polystyrene and are widely used as an ornament for birthday parties. During the sixtieth party, in fact, this number 60 box if filled with coloured sugared almonds and placed on the table where you will turn off the candles for the sixtieth time is a nice decoration. Thanks to this decoration, even the photos of your sixtieth birthday will be colourful and special. You can keep this number 60 box for sugared almonds in polystyrene for as long as you wish. 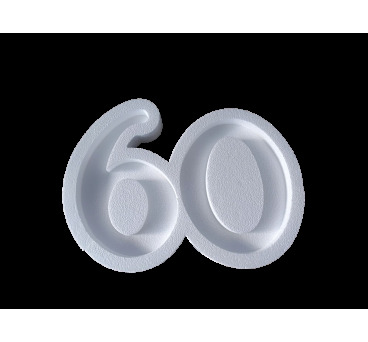 In fact, the polystyrene of which the number 60 box for Sixtieth birthday is made is very resistant and long lasting. Therefore, after using the Number 60 box for sugared almonds in polystyrene as a decoration for your party, this little number can be decorated and displayed on a shelf in your bedroom. Thanks to the versatile properties of polystyrene, you can also choose to use this number 60 polystyrene sugared almonds box as a gift idea. Decorating this box with glitter and hot glue, you can create a shiny decoration. In recent times, the Sixtieth Birthday’s sugared almonds buffet is began very popular. The Sixtieth Birthday’s sugared almonds buffet consists in setting up a table with a large variety of sugared almonds in various flavours and colours. In this way, you can allow your guests to taste many varieties of sugared almonds and have fun choosing the ones they like the most. To make your Sixtieth Birthday’s sugared almonds buffet more personal, you can use this polystyrene number 60 box. These adorable 3D decorations have the empty central part to be filled and decorated, as you like with your favourite sugared almonds. They are suitable to be used both for the Sixtieth Birthday’s sugared almonds buffet of a boy or a girl, as you choose the colour of the sugared almonds. You can choose the amount of sugared almonds to insert in this box. In fact, depending on the type of sugared almonds and their size you can customize your Sixtieth Birthday’s sugared almonds buffet. Using small, colourful sugared almonds, you can create a fantastic decoration, very cheerful and lively. If you are looking for a more sober decoration, you can select sugared almonds of two different colours and arrange them to form shades of colour. The polystyrene of this polystyrene Number 60 box for the sixtieth birthday is a highly transpiring and insulating material; therefore, it does not allow the formation of bacteria. Because of its amazing characteristic it does not involve any health risks and it is absolutely hygienic to fill it with sugared almonds for sixtieth birthday In short, this Number 60 box for Sixtieth birthday is a fantastic element to celebrate the party. The number 60 mould in variety of sizes is of excellent quality. Our company with years of experience in processing and manufacturing of polystyrene can boast the high quality of its products. Our catalogue of number 60 mould in variety of sizes allows you to choose the size that best suits your needs. You can choose number 60 moulds with height 2 inches and widths of 13x10 inches and 18.5x14 inches. The Deart Polistirolo guarantees the customer quality and reliability, with fast and safe shipments.